Odd though it may seem, this book actually grew out of The Fire Ant Wars. In that book, I was primarily interested in American ideas about nature. I decided to look at Bigfoot in my second book because it seemed to me that the creature acted as a screen onto which Americans could project various ideas about nature and wilderness. So much for that hypothesis. The book ended up taking a completely different direction. Instead, I became fascinated by how knowledge about this beast moved through American society, how sometimes it was parasitic on science, and sometimes it was opposed to conventional scientific wisdom. Bigfoot first came into view during the late 1950s, riding the crest of interest in the Abominable Snowman and Sasquatch. Over the next several years, the different legends were yoked together, and then concern about the beasts dwindled. It was revived in 1967, when Roger Patterson and Bob Gimlin claimed to have filmed a female Bigfoot walking through the forest of northern California, not far from where the tracks that first brought Bigfoot to the world's attention were found. Over the next fifteen years or so, Bigfoot became a cultural phenomenon, in large part because of its complicated relationship with white working-class men--it was in their entertainments that the beast was most often found. By the 1980s, the creature passed into middle-class culture, in the process both becoming and co-opted into consumer society. And that is how knowledge of Bigfoot was so often perpetuated at the end of the twentieth century, in commercials--for beer and beef jerky and a host of other products. It was a long, strange journey. Cromercox, The End of the Pier Show, 4 July 2011. Jennifer Atteberry, Journal of Folklore Research November 2010. Elsa Dixler, "Paperback Row" New York Times 31 October 2010, BR24. John Bindernagel, Journal of Scientific Exploration 23 (2010): 319-322. Paul Lucier, Isis 101 (2010): 250-251. Benjamin Radford, 'Bigfoot Beliefs in Cultural Context,' Skeptical Inquirer 34 no. 2, March/April 2010, 59-60. Keith Little, Thecorch.com, 23 Feb. 2010. Richard Ravalli, Journal of American Culture 32 (2009):345-346. Cordelia E. Barrera, Journal of Popular Culture 42 (2009): 1137-1139. K. D. Winward, Choice, October 2009. Jim, Jim's Book Reviews, 9 October 2009. H.J. Kirchhoff, "Big Story, Big Dreams," Toronto Globe and Mail 13 August 2009. Scott Bradfield, 'Bigfoot: The Life and Times of a Legend by Joshua Blu Buhs and Anatomy of a Beast: Obsession and Myth on the Trail of Bigfoot by Michael McLeod,' bookforum.com 31 July 2009. Beatriz Burgos, "El Regreso de Pie Grande y sus Misterios," Terra 17 July 2009. Andrew M. Kuchling, Book Diary 13 July 2009. Daniel Perez, "Book Reviews," Bigfoot Times July 2009.
bf2006, "Book Review: Bigfoot: The Life and Times of a Legend by Joshua Blu Buhs," Southeast Sasquatch Association 14 July 2009. 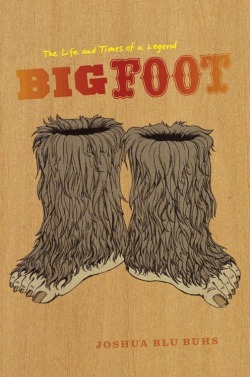 Briefly Noted, "Bigfoot: The Life and Times of a Legend," The New Yorker 6 July 2009. 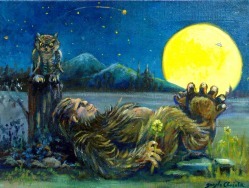 Philip Hoare, "Bigfoot The Life and Times of a Legend by Joshua Blu Buhs: Review," The Telegraph, 21 June 2009. Geoff Pevere, "So, Whatever Happened to Bigfoot," Guelph Mercury 20 June 2009. Brian Switek, Laelaps, Science Blogs 8 June 2009. Florence Williams, "Be Very Afraid," New York Times Sunday Book Review 7 June 2009, BR19. J. Caleb Mozzocco, Everyday is Like Wednesday 4 June 2009. 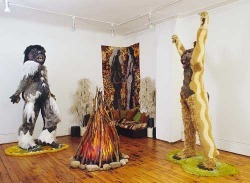 Tom Dodge, "'Bigfoot' by Joshua Blu Buhs: He's More Than a Shaggy Monster; He's a Social Barometer," Dallas Morning News 26 May 2009. 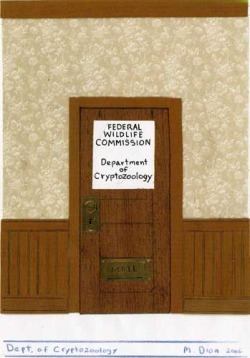 Loren Coleman, "Buhs and the Bigfooters," Cryptomundo 17 May 2009. Paul Fattig, "Author Explores Bigfoot Fascination," Medford Mail Tribune 17 May 2009. David Laskin, "Tracking Sasquatch Lore, Sizable Zeal Is Always Afoot" Washington Post 2 May 2009. Sumit Paul-Choudhury, New Scientist 4 April 2009. Jeremy Spencer, Library Journal 1 March 2009. Fitch, Marc , Paranormal Nation: Why America Needs Ghosts, UFOs, and Bigfoot Santa Barbara, CA: ABC Clio, 2013. Carla Nappi, "On Yeti and Being Just," Animals and the Human Imagination. Aaron Gross, Anne Vallely, eds. Columbia, NY: Columbia University Press, 2012. Lorraine Ash, "Witnesses Report Confusion, Fear When Seeing a Sasquatch," Daily Post 16 December 2012. "Featured Design," Faceout Books April 2010. EpicGilgamesh, 'Bigfoot Author, Blu Buhs, Blogs for Washington Post,' Bigfoot Lunch Club 18 December 2009. Nick Owchar, 'Angels, Devils, and Bigfoot,' L.A. Times.com 6 December 2009. Jon Foro, 'Omni Daily Crush,' Omnivoracious 11 Sepember 2009. 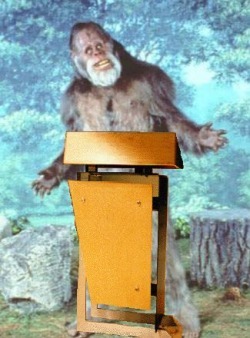 "Bigfoot: An Attack on Feminism?," Hoax Forum 8 September 2009. D. B. Donlon, 'Focusing on the Psychological Again,' The Blogsquatcher, 17 July 2009. Sigrid Schmalzer and Joshua Buhs, 'Bigfoot and the Yeren: A Conversation about Wildmen,' The Chicago Blog, 7-9 July 2009, Parts I, II, and III. Sarah Librarian, Reading 2.0 1 July 2009. Joshua Blu Buhs, 'Bigfoot: The Life and Times of a Legend,' New York Post 28 June 2009. David Schwartzman, 'Bigfoot, Seriously,' New York Times Sunday Book Review 28 June 2009. Loren Coleman, 'Bigfoot Author Links Bigfoot Racism to Michael Jackson,' Cryptomundo 27 June 2009. Chris Daley, 'Megan Fox and Saab Both Go Postmodern: What Is Postmodern, Anyway?,' Los Angeles Times Jacket Copy 25 June 2009. Bigfoot Field Researchers Organization 9 June 2009. Princess Sparkle Pony, Princess Sparkle Pony's Photo Blog 22 May 2009. Christie Henry, 'Christie Henry on Buhs’ Bigfoot,' The Front Table 19 May 2009. D. B. Donlon, 'It's Plainly Obvious It Is All in Your Mind,' The Blogsquatcher, 30 April 2009. Wisconsin Public Radio, "To The Best of Our Knowledge," 100725A, "Monsters," 25 July 2010. Steven Streufert, BIGFOOT'S bLOG 6 October 2009. Patt Morrison, SCPR 89.1/89.3/90.3 7 September 2009. Mike Pintek, Pintek Tonight, KDKA 1020 17 July 2009. Lori Kozlowski, 'Bigfoot: Why Do We Believe in You?,' Los Angeles Times Jacket Copy 2 July 2009. David Inge, Focus580, WILL, Illinois Public Radio 8 June 2009. Sean Moncrieff, 'Moncrieff,' Newstalk Ireland 4 June 2009. Ron Charles, Washington Post Book World 1 May 2009. Levi Stahl, The University of Chicago Press April 2009. J. D. Lozier, P. Aniello, and M. J. Hickerson, 'Predicting the Distribution of Sasquatch in Western North America: Anything Goes with Ecological Niche Modelling,' Journal of Biogeography 2009.